A stirring century from Tamim Iqbal on day four at Lord's was the highlight as Bangladesh batted brilliantly to give themselves a chance of avoiding defeat following six losses in six Tests against England. Tamim hit an eye-catching 103 from 100 balls, but Imrul Kayes (75) and Junaid Sidique (66 not out) were no bit-part players. Bangladesh, invited to follow on 223 runs behind when their first innings ended on 282 within the first hour, ended the day 105 ahead on 328-5. The absence of a fifth bowler in easy batting conditions was, not for the first time, sorely felt by England's attack. Tamim, 21, is playing with a wrist problem, and would have probably skipped the match had it not been held at a ground that holds so much importance for visiting cricketers. Outscored at one point by his partner, he accelerated superbly in a partnership of 185 with Kayes in barely 38 overs, the highest by a pair of Bangladesh openers in Test cricket. 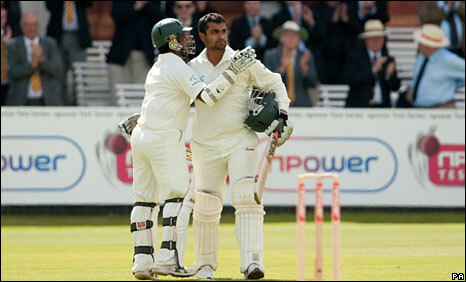 Tamim's effort was his third century in Tests, the fastest by any Bangladeshi and the quickest at Lord's since Mohammad Azharuddin in 1990. Bangladesh have to bat 60 or so overs tomorrow I think. If England need 250 from 40 odd, you would back them to chase it down? England's bowlers, as they had been for much of Friday, were run ragged until Steven Finn removed both Tamim and Kayes in the run-up to tea on the fourth day. In an extended final session, Bangladesh's batsmen enjoyed another fruitful period before James Anderson produced some high-quality swing bowling with the new ball. The left-handed Tamim produced some exquisite pull shots, showed complete disregard for England's cricketer of the year Graeme Swann, and blazed one drive through the covers off Anderson that was reminiscent of Aravinda de Silva. Sunday's play had started with Andrew Strauss's side in a strong position after taking five cheap wickets on the rain-truncated third day to leave Bangladesh on 237-7, well adrift of England's opening 505. With a stiff breeze and sunny intervals, conditions were not so favourable for the bowlers. But Anderson bowled Shahadat Hossain and Mahmudullah without too much bother before Tim Bresnan had Rubel Hossain taken at slip, Bangladesh adding 45 runs to their total. With the follow-on enforced, Tamim and Kayes survived one or two hairy moments to get through the first 14 overs leading up to lunch, reaching 69-0, and the fun continued in the afternoon. It was important for England not to let the partnership get out of hand, but Swann failed to get his hands to a low Kayes edge off Anderson with the batsman on 30, which just about carried on the full. Tamim was quiet for a while, but then stepped up several gears, hitting three boundaries in a row off Finn, a lucky edge just past gully sandwiched by a clumping on-drive and a terrific pull off one leg. It got even more exciting when Tamim slog-swept two sixes in an over off Swann, and as he eyed his third Test century Kayes reached his first fifty at this level with a well-executed sweep shot for four off the expensive Swann. Kayes came close to falling lbw to Swann, but Tamim for a while was unstoppable. On 87, he cut the first ball of a Bresnan over for four, drove the next past mid-off for another boundary, worked a couple off the next ball, and still had time in the same over to drive the Yorkshire bowler over mid-on to reach a century that was warmly applauded. Tamim ran half-way to the dressing room in celebration, signalling his desire to have his name inscribed on the Lord's honours board. The fun could not last for ever as Tamim's cricket always verged on the risky, and it was a decent bouncer from Finn that had him miscuing his pull, to be easily held by Jonathan Trott at fine leg. Finn soon removed Kayes too, fending off another short ball straight to provide Ian Bell with a sharp catch at short leg. Bangladesh resumed after tea on 189-2, with two batsmen still to score and 34 runs behind. It took a strength-sapping two hours for England to collect a third wicket, however, with the pitch having turned docile as often happens towards the end of a Lord's Test. Siddique and Jahurul Islam put on exactly 100 in 30 overs. It was a well-paced partnership, the two batsmen minimising risk as they largely concentrated on defence until waiting for poor balls to put away. Long after Bangladesh had moved into the lead, Strauss continued to post attacking fields, but was frustrated when occasional edges eluded the catching men. Jahurul (46) finally fell to Trott of all people, jabbing up a catch via his pad which the medium-pacer himself took diving forward. Mohammad Ashraful got going with some fluent off-side drives but Anderson, taking the new ball, dismissed him with a good delivery that took the outside edge and flew to Matt Prior. Bangladesh sent out nightwatchman Shahadat, who was promptly bowled by Bresnan. Suddenly things did not look quite so dismal for England.